Hectic day people, I couldn’t wait to get home and read the chapter again in peace and quiet. Wow, Shin is unstoppable! He’s clearly on another level and it happened right under my nose lol. 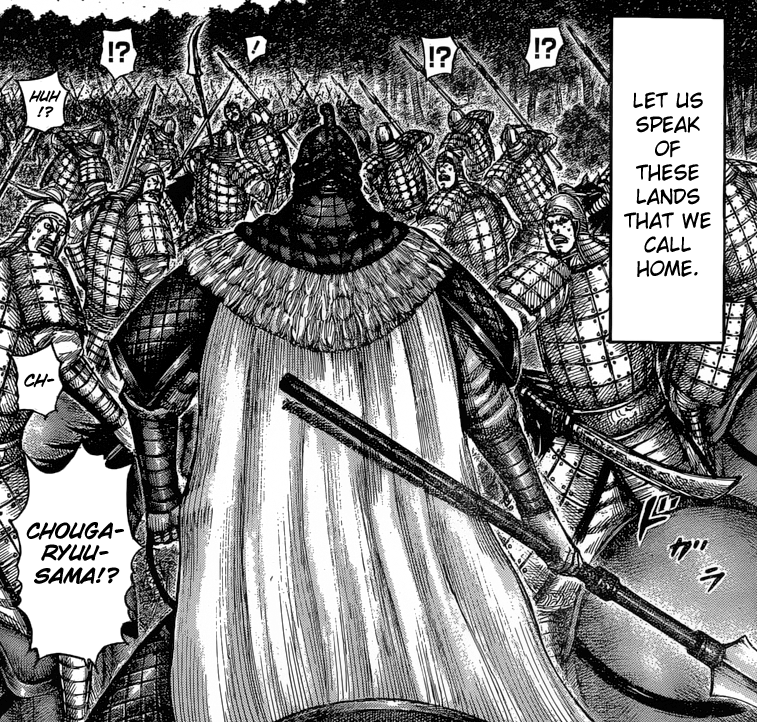 I reminded of the time Ou Ki gave his unit a name (ch.121), but there was more and not in this order, he said that, “if he killed the enemy’s talented generals, especially the ones more capable at leadership or analyzing the field, the greater the disruption when they are lost” (ch.120). I don’t know if he was listening or not but it rings true. What will Chou Ga Ryuu’s colleagues do now? How will they cope with his defeat? I suspect they may search for a way to approach Shin as a team coz I don’t see how else they can beat him. What a chapter, complete with thrills and chills, it's absolutely insane! Hey! Here’s another idea. What if, the separate detachment he spoke of is in fact coming from a neighboring army and not his? This could be why the HSU’s HQ hasn’t detected anything yet. It’s a possibility. I expect Shin to kick his arse but I’m not completely convinced that he will kill Chou Ga Ryuu and for all the obvious reasons, of course. Shin is wounded, malnourished, and not at peak performance. Whereas, Chou Ga Ryuu and his personal soldiers are all at optimal condition. But with all this aside, do you see what happened? Shin is the only one who forced his way through Chou Ga Ryuu’s soldiers. Right now, his backside is a lil’ vulnerable. Remember what Zhao did to Ou Ki? Suppose they gang up on Shin. It's not beyond the realm of possibility considering Zhao's track record for such acts against Qin. A Kou and Ou Hon are current examples. Do we attribute Rin Shou Jo’s foresight as genuine or is his deteriorating health responsible? Who knows? At least, we get the big reveal. Still, I think he* got it wrong cause the only one ‘slaughtering enemies drove after drove’ is the HSU. This is my takeaway concerning their friendly banter. Hope Chou Ga Ryuu puts up a good fight. Anyone else worried about the HSU’s HQ? Guys, you all have my thanks...nice work! IMHO the chapter's caption leaves room for interpretation yet some will argue that the meaning behind it is clear. That the definition of - the best - does not imply there’s a broader scope in mind and instead points to Kyou Kai or the HSU as a whole and I agree, but I'm not completely convinced. I think there's a deeper meaning behind it and here's why. When Shin reached Shou Sa who, for all intents and purposes, was as close as you can be to death without crossing over leaps into his arms with a look of satisfaction, he immediately establishes who the best truly is. I just think that this final attempt by Shou Sa deserves proper recognition. You see, he wandered from army to army but that stopped with the HSU. Simply put, there is something about this unit that others lack and we all know what this is. He has a unique quality about him. We can all sum up what we think the best is, or what makes a certain individual stand out from the rest, but I think that one way to ensure you are making the most progress possible on your journey to success is by holding yourself to a higher standard and Shin is a good example. My point is, that the words, the best, can have many definitions. It’s not just about who’s stronger, or who’s better with a sword, it’s also the aspects of an individual that are not visually apparent. I just wanted to share this with all of you. I was a bit skeptical about Kyou Kai’s new plan but I’m glad it actually worked. I wasn’t sure of the outcome so I was afraid something awful was lurking and waiting for Kyou Kai. Usually, I’m less concerned about her well-being but this entire conflict between these two parties has been nothing short of emotional ups and downs, especially when we consider all the other issues that they’ve had to endure. It’s absolutely nothing short of a miracle that she survived this without a scratch (I’m obviously exaggerating her physical condition but you get the gist of what I mean), Kyou Kai is alright compared to other less fortunate souls. Anyway, I don’t believe that she has ever pushed herself harder. Shin has but I don’t recall for Kyou Kai and the time she defeated her sisters is kind of a gray area for me because food wasn’t a big issue and definitely not the cause for a major handicap. Kudos to Kyou Kai who definitely deserves an award because without her I don’t know what would’ve happened to the HSU. Also, what did Chou Ga Ryuu realize? Will it matter now anyway? A little busy right now but definitely want to discuss Kyou Kai anyway I need time to absorb the rest of the chapter. To all who are the best, indeed! (Ch.595 Pg.21) RIP Shou Sa. I’ve been thinking about this for a good while now and I need to get it off my chest. 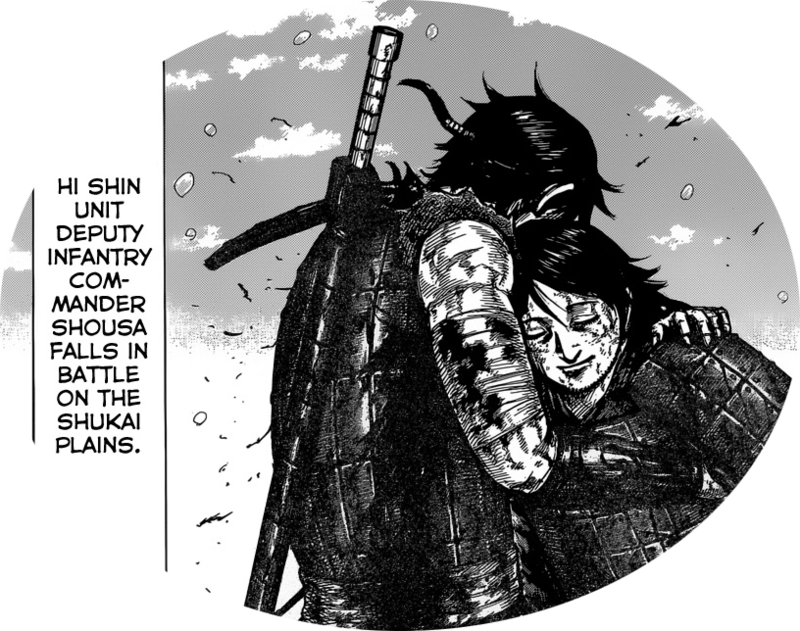 Unless we are in “Bizarro World” (and I know we are not) Shin openly admitting that he’s hurt on the battlefield in front of his men feels so out of character. It’s a sign of weakness that can trickle down to the ranks of his men or worse the enemy could pick up on it as well. If so, he could become Zhao’s most important target. Who’s writing this godforsaken plot? Damn…I’m having a tough time accepting that Shin is hurt. We’ve seen him close wounds on command. Maybe it’s the malnutrition taking its toll. Whatever it is there’s no denying the situation looks dreadful. So much so that I’m getting flashes of Kyou Kai in grave danger. It’s terrible, right? Some of you may think it’s impossible given how skilled she is and that the HSU is chasing from behind and who will never allow something like that to happen. I agree. But, there are too many variables in war and this one is no different. All I’m saying is that none of this makes any sense unless you take a step back and look at the similarities between previous iconic characters and their past events. Could this be a prelude to the inevitable? Something terrible? I hope not. Still, Kyou Kai resembles another who was famous for her brutal offensive tendencies leaving only body parts in her wake. Their resemblance is uncanny yet we all know what happened to Kyou. Is this how it’s supposed to be? Will history repeat itself? Consider Shin. What will become of him? Will he resemble the figure in the opening chapter, Lee Shin? Hardened by life’s unexpected twists. A product of circumstance. I ignored Shin’s injury last week because I honestly thought it was pretty insignificant. I thought he would brush it off as nothing more than a flesh wound but, that’s not the case. And now, Kyou Kai is forced to push her limits once again. I want to say I like her new plan but the Zhao are now aware of her weakness. If she drifts too far ahead of everyone else she may not get the breather she needs to continue. Then again, everyone is doing the same, so why do I feel like this is all a big mistake. Well, I hate to stress this fact but with everyone so focused on getting Chou Ga Ryuu it’s possible and maybe even accurate to say, that they are oblivious to everything else, especially HQ. Personally, I don’t care what happens to HQ. The only reason I refer to it (again) is because Ten is there. And, I’d hate for history to repeat itself. Suppose she's taken hostage? What then? Chou Ga Ryuu’s tactics kinda remind me of Ou Sen lol. Is he really running or is it a lure? I hope it’s the former then again there might be no limit to his schemes. I hope I’m wrong.